This was another holiday read. I've been meaning to read this book for over 20 years. It has been on the bookshelves at my parent's house since before i was born. I was always 'about to read it'. I think I was a little wary due to the spooky cover. Keeping myself awake because of a book happened too often! This is the tale of how a couple come to own the titular Gad's Hall. Partway into the book it steps back in time to an earlier part of the history of Gad's Hall. It tells the tale of the family that lived there at the time. I enjoyed both stories very much. My only point is that it is not actually that scary. The cover is misleading. 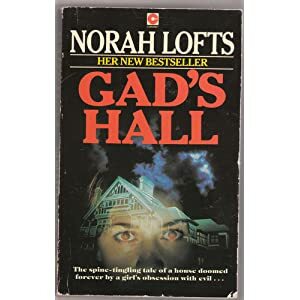 It is the first of two books, the second being The Haunting of Gad's Hall. This book is the set up for that. It's great that the set up is so deep. You really get to know both families. There are sparks of what is to come in this book but I'm guessing that the sequel will spook me much more. I'm very much looking forward to reading it. I feel I can't properly judge this, knowing there's a sequel. A sequel which seems it will fulfil the spookiness of the cover of this book.